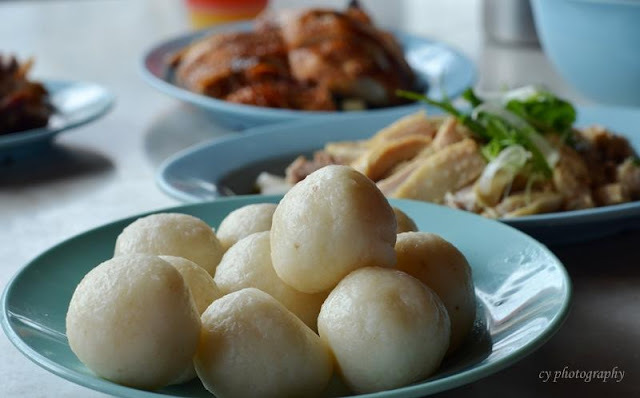 It would probably be a crime if one visited Malacca and not tried their famous chicken rice balls. With some asking around and checking of notice boards at Melaka Sentral (Malay spelling for Malacca Central), we boarded one of their domestic buses which would bring us to Jonker area (where the main stretch of eateries are based). We had a quotation from the taxi counter at Melaka Sentral which would set us back by RM15 for the trip. Considering how short the journey was, we decided to give domestic bus a shot. It was definitely one of the most unique bus experiences I had ever had, considering the stark contrast with the local SMRT buses or even the buses in UK. Momentarily, the old memorabilia picture collections of Singapore's public buses in the 70-80s seemed to come to life and we were really excited! Regardless of where you board or alight, the ticket was a fixed fee of RM1. You would need to wait till the town bus gets relatively full with passengers before the driver start driving. The domestic town buses ran on fixated routes with stipulated bus stops. As advised by the information counter at Melaka Sentral, Town Bus No. 17 would bring us to Jonker district. The domestic bus we boarded in Melaka at top pic while the bottom pic showed a Singapore bus. At one of the stops where most of the people alighted, we mistook it to be the Jonker District and followed suit. Attracted by a corner restaurant that boasted of the famous Melaka Chicken Rice Ball, we waited no further to give it a try! However it did not quite turned out what we expected. Days later, we found a much nicer authentic tasting Melaka chicken rice ball! We honestly felt that this eatery did well in terms of attracting diners with the decoration, publicity and advertising. 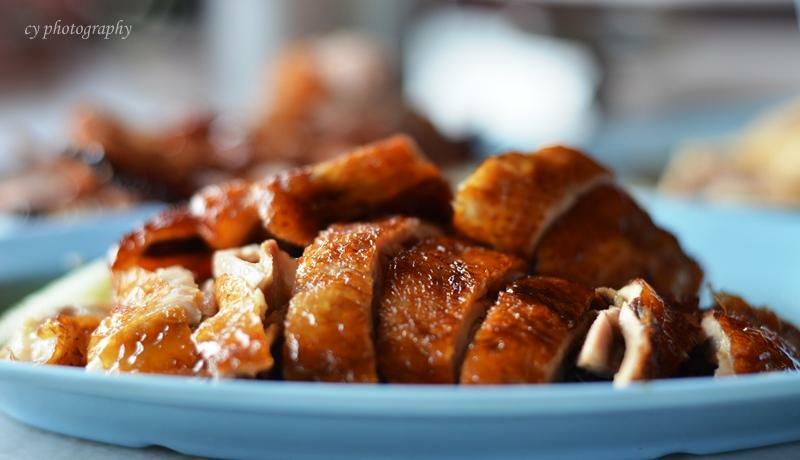 With an air-conditioned setting and celebrities to publicize, including Hong Kong's famous gourmet, Choi Lam, it certainly bode well for their business. We later noticed that all outlets of Famosa Chicken Rice Balls had this poster outside their shop, however only this one had the autograph of Choi Lam. (+) Slightly larger serving per ball compared to others we had tried. (+) Unique presentation instead of having a plate of chicken rice. 5 balls equate to one plate. (+) Very smooth exterior (glazed with oil), probably cos they were made by machine now. (-) Rice lacked fragrance desired of a typical plate of chicken rice. (-) The rice was slightly hard, and compressed very tightly which made the balls very dense. (-) Accompanying chili sauce was very watery and not spicy enough to give a 'kick'. It was a complete letdown and parred miserably in terms of industry standard. A case of over-commercialization maybe? (+) Skin was thin and crisp. (+) Golden delicious brown roast, without depriving the chicken of moisture. 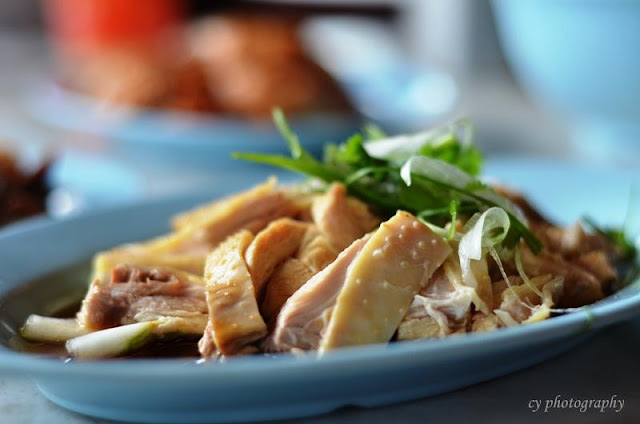 (+) Subtly sweet and succulent chicken pieces when consumed on its own. (-) Lacked the 'oomph' required from the accompanying chicken rice balls and chili sauce. (-) The chicken portions did not have much meat under the fragrant skin. (+) Juicy, succulent and tender chicken portions. (+) Like the roast chicken, had a subtle sweetness, complemented by the drizzle of sesame oil and soy sauce, had a good balance of flavours. (-) The chicken seemed to have too much fat to be a kampung chicken. We almost thought it was the roasted chicken that was the kampung chicken but after a check with the waitress and our orders, seemed that the fault was with the chicken. (-) Once again, chicken without a good chili sauce as condiment just did not make the cut. (+) Very crispy skin, in fact the crispiest I ever had. The last best was at Hao Bi in JB. (+) Crispy skin tasted like it was fried after being roasted, yet not overly done. (+) The meat underneath the layer of skin and fats was tender and maintained succulence. (+) Good choice of meat cut for the siu yuk, in terms of lean-fat distribution. (-) The skin was slightly greasy, which led us to assume about it potentially being fried. (-) The accompanying sauce was overwhelmingly sweet and tasted much like hoi sin sauce. (-) Same chili sauce as the chicken, i.e. 'FAIL'. (-) Poor condiments to match the perfect roast, advice: consume on its own. (-) The roast was not fragrant enough, not were there any crunch bits to the surface. 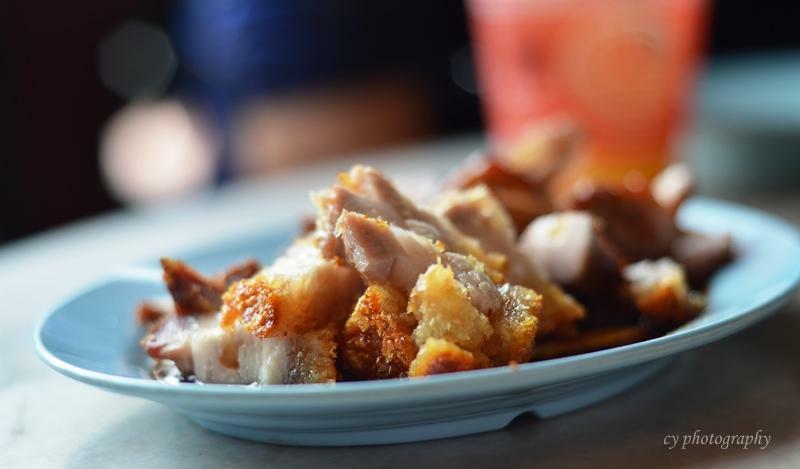 (-) Choice of meat cut for the char siew was poor, lacked sufficient juicy fats, which left the barbecued pork a tad dry on certain slices. 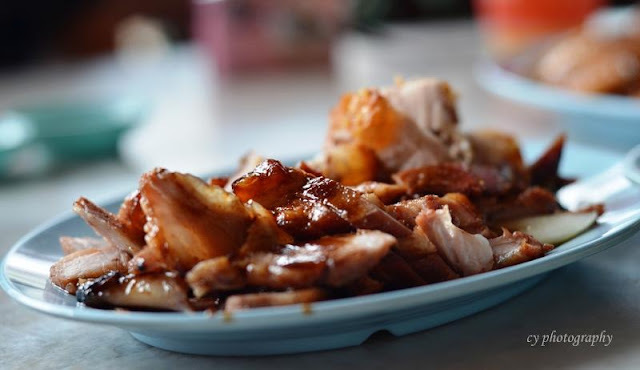 Being a huge fan of char siew and siu yuk, I am especially critical in my judgment, considering the availability in Asia. The char siew served was definitely not catered to my demanding palette. It might be good to wash down the sweetness (from the condiments) and also to relieve yourself of the heat from the weather with a cup of ice cold lime juice (RM2.50/-). Not overly sweet but could be improved with a slightly stronger zest from the limes. With a brightly lid, comfortable setting, walls plastered with photographs of celebrities patronizing and media's recommendation and special displays as such which helped diners understood better about the origin and making of their uniquely different chicken rice balls was indeed a good dining experience, however it was not certainly what we came to Melaka for. What I realized from our visit to Famosa was that it might have been a great chicken rice ball stall in the past with raving reviews from the internet, however in order to meet with the harsh conditions for survival especially in the Food & Beverage industry, they succumbed to commercialize their business. This could be seen from the number of outlets they currently have in Melaka. Definitely great advertising and publicity, which attract new customers/tourists visiting Melaka (which are plenty by the way) but my conviction is that good quality food always prevails eventually. In the next few days, we would be featuring the best chicken rice (or chicken rice ball for that matter) tasted in Melaka and arguably Singapore, well in our humble opinions anyway, please stay tuned! Hi Tom, thanks for dropping by and bringing to our attention your website! Particularly enjoyed the write-up on Hoe Kee since we did not have enough stomach space for that before we left Melaka, but seems like we dint miss out too much! Looking forward to more of your write-ups!